The Vortex by Vapor Hookahs is a revolutionary Hookah Bowl that allows for the Flavored Tobacco juices to stay inside the top of the bowl instead of running down the inside of the bowl, allowing for an extended and enhanced smoking session. This glossy Vortex Bowl is very sturdy, and will most likely fit on any type of Hookah.This type of Vortex Bowl is preferred by Hookah smokers who are looking to cater their Hookah with a more unique type of bowl. It is available in an assortment of colors to match any hookah theme possible. The Vortex Bowl can hold approximately 25 grams of Flavored Tobacco. Grommet Compatibility This Hookah Bowl typically requires using a Chinese Rubber Bowl Grommet to connect this Hookah Bowl to the top of the Hookah stem. 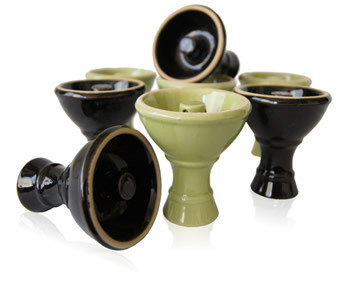 Click Here to view the Chinese Rubber Bowl Grommet.